The ES700 from TRUE is a premium elliptical trainer with an impressive suite of features. One of the top-rated cross trainers in its class, the machine has all the standard TRUE features and a couple of new additions like adjustable stride and multiple console options. The ES700 has Cardio 360 for a full body workout and HRC Cruise Control for target-based heart rate training. It has multi-grip handles that allow you to target different muscle groups and orthopedic cushioned footpads that lessen the strain on your joints. It has an electronically adjustable AutoStride feature, which helps you find your preferred stride length. It also gives you the option of choosing from two consoles – Emerge and Escalate. 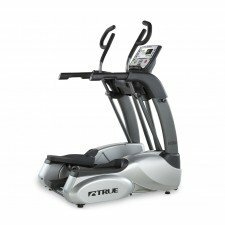 Unit Weight/Dimensions — 281 lbs; 49" x 32.5"
The compact design of the TRUE ES700 elliptical is something that seems to surprise many people – especially those who are used to seeing the typical bulky high-end cross trainers from other companies that take up a lot of space. The machine comes with the two unique TRUE programs – Cardio 360 and HRC Cruise Control. Cardio 360 allows you to work the muscles in your upper body or lower body through isolated workouts or stimulate all the major muscle groups in your body through a set of full body workouts. HRC Cruise Control lets you set a target heart rate and automatically makes adjustments to ensure you maintain the same heart rate until you finish your workout. The orthopedic cushioned footpads are very comfortable to step into. They reduce the amount of strain placed on your joints while you train. People who have used this machine are satisfied with these footpads. The AutoStride feature is a new addition, ﻿not found on the PS300 model﻿, which seems to have impressed most people. It helps you find the ideal stride length – anywhere from 16” to 27” – based on your movement. So, irrespective of your height and body type, you can find your perfect stride length and work out comfortably. The multiple console option is also a hit with people. You can choose to buy the machine with the basic Emerge LED console or pay $400 more and opt for the Escalate LCD console. The Escalate console comes with 28 built-in workout programs, an iPod dock, and a USB port. The USB port, in particular, seems to be popular with tech-savvy users as it allows them to upload and download workout data easily. The downloaded data can be integrated into third party apps for tracking fitness progress. The TRUE ES700 is yet another top-notch elliptical trainer from the popular company. It has everything you expect to see in a high-end elliptical machine – rock solid build, space-friendly design, an excellent suite of features, and innovative, user-friendly technology. If you can afford it, there is no better machine you can get for the price tag. If you buy the ES700, it is advisable to opt for the advanced Escalate console as it helps you get the most out of the machine. It allows you to listen to songs, upload and download workout stats, and also saves energy by going into sleep mode whenever the machine is not in use.